Red lipsticks can never be out of fashion and can be used throughout the year. Red lipstick looks classy and elegant if worn properly. However, finding a good red lipstick can be tricky that suits and goes well with your complexion. Today, I will be sharing this golden eye makeup look that will be appropriate with the red lips. It looks so much like the traditional Indian bridal makeup. Moreover, when you pair golden eye make up with red lips then you can never go wrong. It is a combination that works like a charm provided you can carry the red lips. In fact, red is a color that suits almost all the skin tones and there is a perfect red made for everyone. Like, I think I can carry red with orange undertones better that the other types of red since I have skin with yellow undertones. You can wear this look for any outfit and it will look great. Then I have applied a peachy pink shade on the crease so as to give it more definition. For the face makeup I have used Oriflame Peach me perfect and over that I lightly applied L’Oreal Mineral foundation in the Golden Glow (review pending). I have used Coloressence blush in shade 4 very lightly, which has some very subtle and nice shimmer in it. 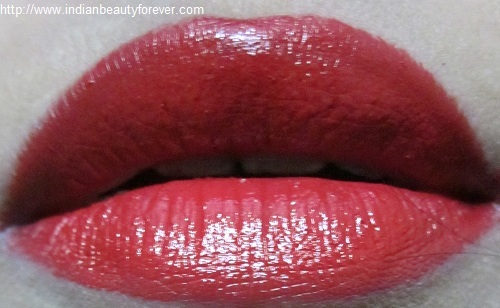 For the lips, I am wearing Avon lipstick in Cherry red lipstick then Colorbar obsessed orange on top of it. when using red lipsticks or any other deep color try to apply with a lipstick brush. 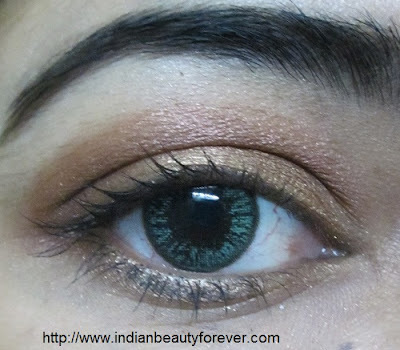 Here is the overall golden eye and red lips make up look. I have never been comfortable sharing my pics here blame it on my shy nature !! gorgeous lip color... i love the overall look!! 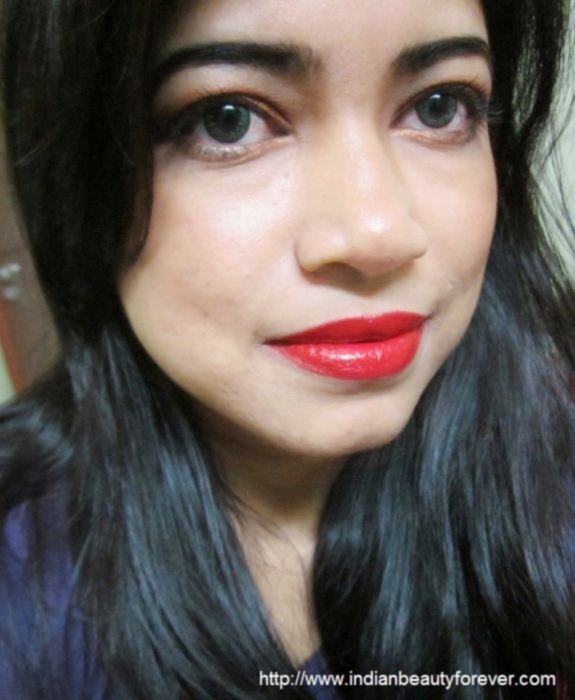 love the red lip, its bright but also soft, I think its very wearable shade of red! neisha dear.so cute and lovely look.i love the golden eyes.how are u dear? I am fine hope you are good too. oh wow! that's a gorgeous pop of red, so brilliant! This is one of the favorite look across the globe na, goes well with every attire. :) I had Loreal chrome shine. Simply gorgeous and I loved it! This would be great for brides who wants to wear least on their special day. I agree Shazia, indeed lot of ladies go for minimal make up on D- days. Very pretty look! well done! Love the lip color(s) :D red and orange = super bold lips :D <3 it!